Here's an opportunity to have a direct impact on the development of spatial precipitation and infiltration methods in HEC-RAS. 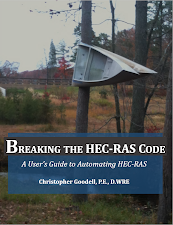 Please read the message from Gary Brunner, Lead Developer of HEC-RAS, and if you would like to provide feedback to his questions, please do so in the comments section at the bottom of this post. If you would rather email me your response, you can send them to Chris.Goodell@KleinschmidtGroup.com. I will close the poll on October 3rd, so please have your responses in by then. This poll is now closed. Thanks to all who participated. SCS Curve Number. However modified to allow for the following: User entered initial loss; separating Impervious from pervious surfaces, so curve number will only be applied to pervious surfaces; and re-instating initial loss after a dry period. Green and Ampt. During periods of no or low rainfall, the soil moisture is redistributed and the infiltration capacity is recovered." Please answer the following questions and post in the comments section below or email to Chris.Goodell@KleinschmidtGroup.com. 1. Do you think it is a good idea to put infiltration methods into HEC-RAS? 2. If so, what methods would you like to see? 3. Have you used the SCS Curve number method in any hydrologic modeling investigations? 4. If you have used the SCS method, was it successful in calibrating the model? Or did you need to switch to a different method? Yes, I have been wanting this since I started using rain-on-grid. The methods listed above are all I use, SCS CN, Green and Ampt, and initial and constant loss. Yes. For most of our clients, this is the standard that they expect. If I am unable to get the model calibrated using the curve number, which has happened, I generally adjust other inputs, such as rainfall, roughness, longest flow path timings, storage, and the like. 2. As well as the methods that you've mentioned in the post, I would really like to also see the methods that are available in MIKE by DHI (sorry for swearing!). The MIKE methods are required by some councils in New Zealand, and so it would be useful for HEC (HMS and RAS) to incorporate them. 3. The SCS Curve number method is widely used in NZ, especially in the absence of countrywide rainfall-runoff guidelines. 4. I haven't done any major calibration of SCS to NZ conditions. The most widely known NZ calibration is Auckland Council's TP108 guideline that includes an adjustment to the way that Ia is calculated and a shift in the hydrologic soil group. 1. Yes, absolutely. People ask if RAS can do this all the time. 2. Initial+Constant, SCS CN, Green and Ampt. Some sort of user defined function capability would be icing on the cake. 4. I was successful. That study was *not* in an arid climate. Ans1: yes it’s a good idea. The SCS method was successful. 1. Yes, incorporating losses into the software will be a great time saver, rather than manually adjusting the input hyetograph. 3. Yes, but not often. - Yes, I am really looking forward to do so. I am dealing on a project on storm risk magement for a small catchment. Since HEC-RAS is not able to have infiltration and spatially variable (!) precipitation for radar rainfall, we switched to another model. But this does not have such sophisticated representation of channel geometry. - I think the classical ones which you mentioned for event based modelling will be just fine. Runoff coefficients must be temporally variable? We are using SCS especially for small and partly urbanized areas when we don't have the sewer ssystem implemented and coupled. Since Green and Ampt is a real physical based infiltration approach with which I don't want to model the losses to sewer system in urban areas is good to have an emprical one as well. I only did event based modeling on a small scale for which it was fine. But as soon as slower processes play a role, also for continous modeling and subsurface flow we switched to more sophisticated approaches/models. Can you recommend some publications here on the application of direct precipitation in HEC-RAS? 2. SCS-CN, Green-Ampt and Initial and Constant infiltratiom methods. Other methods (provided that are simple) of HMS could be welcome. What about Horton's model? 4. Good performance in semi-arid and tropical climates/soils, but calibration needs. Yes, but with appropriate caveats. 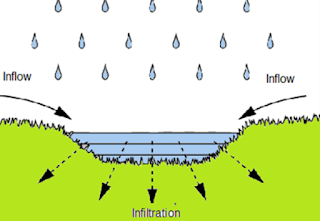 For example, it is not a substitute for a more robust rainfall-runoff model (e.g. HEC-HMS, SWMM), is intended for rain-on-surface modeling, etc. Modified Green-Ampt (not depleting moisture deficit in the top surface layer of soil during initial periods of low rainfall). SCS methodology would be acceptable, but would not be preferred because 2D HEC-RAS is much closer to a physically-based model than empirically-based SCS infiltration methods. Yes, many times, but I prefer more physically-based approaches (typically SWMM). I have never calibrated a model using SCS methodology. There is a lot to consider when addressing infiltration. 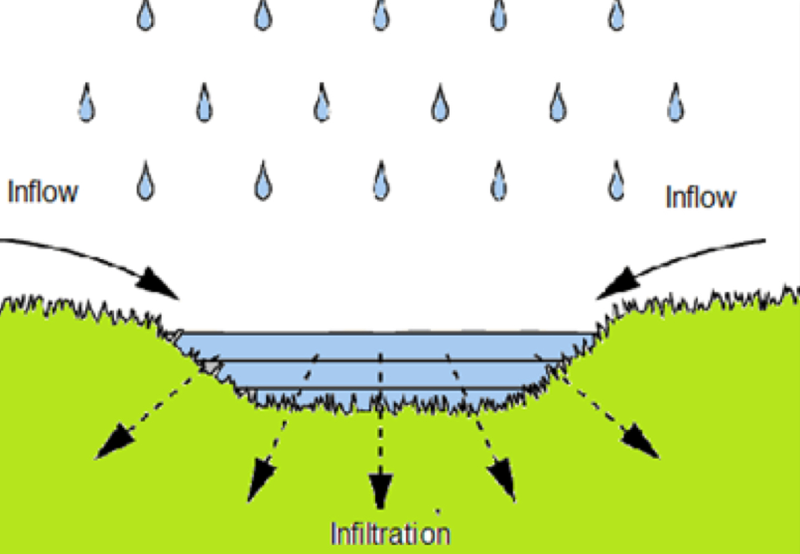 Infiltration losses from applied rainfall can run upwards of 35-50% for 10-year design storms. Urban soils are highly disturbed, and predominate the upper soil layer versus what shows up on SSURGO maps. I've seen cases where loamy soils (per the soils map) in large farm tracts became clay-like from the long-term application of soil amendments. All of these impacts can be addressed with black-box methodology (and I agree with you that all methods involve assumptions), but the closer we stay to physical properties the less we gloss over with our methodological assumptions, and (presumably) the less likely we are to miscalculate infiltration losses. Yes, i do, but drainage engineers must understand what this means to their original hydrologic model. There must be a large outreach and discussion, free seminars discussing the proper way to utilize the method in order to NOT DOUBLE DIP. That will be the largest issue in releasing infiltration means within HEC-RAS. The methods suggested are the only methods that I utilize, in turn methods like the Clark Method should be easily able to adjust the "R" component in order to maintain texas requirement for runoff (or other areas that require different methods) This is being brought up because not only now will 2D modeling complete the infiltration loss but it also will be accounting for the initial abstraction and engineers must understand propoer use. I have had success in calibration with the SCS method, though i did have a colleague who switched to Green n Ampt in a specific region in texas, however i believe the understanding of 2D modeling back then did not match what it is now. I am a strong believer that most if not all models can be calibrated by using the SCS method for hydrology, if it cant then the user should be able to use the optimization function within HEC-HMS in order to tell them how far off they are in which parameters in order to gain calibration. 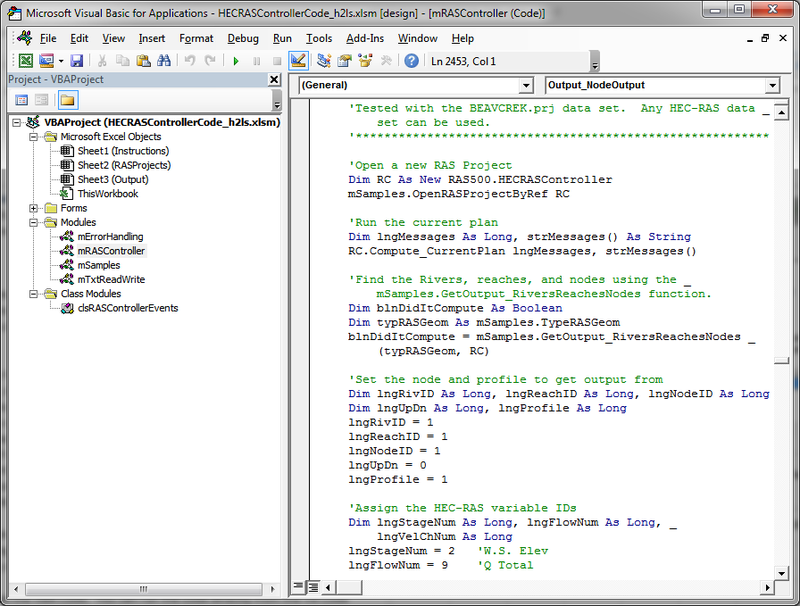 I would like to see variable methods used as HECRAS is a global software that is used by many hydrologists who use different methods that apply to their region. as both methods are still being used by local authorities for small scale flood study projects. Fantastic! I have emailed my comments, Chris. 1. Do you think it is a good idea to put infiltration methods into HEC-RAS? YES!!! I am excited to see infiltration put into HEC-RAS 2D. I have long been a FLO-2D user and one of its greatest strengths is the rainfall-runoff routines. I find that our clients will prescribe the use of FLO-2D in part because of this strength, but I keep thinking that if RAS 2D could do a large rainfall-runoff model then we would see it used more often. At a minimum we will have a different tool which we can use. 2. If so, what methods would you like to see? SCS CN is essential in much of Arizona and for post-burn analyses. I would also suggest that Green-Ampt be incorporated as this is the other major method prescribed by most Arizona drainage manuals. On that note, I would like to see a limiting infiltration depth incorporated into the calculations because 2D models tend to over-infiltrate in some situations. 3. Have you used the SCS Curve number method in any hydrologic modeling investigations? Yes, all the time. 4. If you have used the SCS method, was it successful in calibrating the model? Or did you need to switch to a different method? Yes and no. We routinely calibrate and/or verify FLO-2D SCS models against HMS models and find that in confined watersheds, FLO-2D with SCS parameters will match HMS results in many situations. We have also calibrated our models against gage data (both discharge and volume). FLO-2D always gets the volume right, but there are some who question whether it under-predicts the discharges in distributary areas. I’ve run a couple of RAS rainfall models against FLO-2D rainfall modes (w/o infiltration) and find that RAS tends to generate a hydrograph with as shorter time to peak and higher discharge (my suspicion is that this has much to do with the difference in how the 2 programs define the grid). If RAS came equipped with an infiltration component it would allow us to have another tool available for us in these situations where there is some question as to the discharge predicted by the model. 2) SCS CN but other methods could be useful. 4) The SCS method is eventually successful but typically have had to adjust CN and classifications of land use within TR-55 bounds to calibrate our models (typically to stream gage data). We adjust other parameters as well, but CN adjustments typically get us most of the way there in our calibration. 4. Yes, but only for events of a comparable magnitude rainfall and duration. For extrapolation to different durations or magnitude of rainfall, we generally switched to Green-Ampt or Horton.